One of the many business questions physicians face is whether to outsource their Centricity medical billing to third-party services or do it in-house with Centricity Practice Solutions. Some physicians would assume outsourcing billing to a Centricity medical billing service makes the most sense. After all, they’re the experts with the resources to properly process your claims. while others might want to maintain control of collections and do it all in-house. So how do you make this decision? Both methods of revenue cycle management have benefits and drawbacks. It’s up to the individual practice to weigh the pros and cons before deciding which approach is best. In order to break down in-house billing and outsourced Centricity medical billing in terms of cost and qualitative factors, you’ll need to weigh the differences carefully when assessing the needs of your practice and decide if outsourcing makes sense. You’ll also need to consider your EMR strategy, and whether your billing service can support you with both EMR and billing services. For example, Health 1 offers a combination has a professional in-house cross-functional team of experts in both billing services and the Centricity Practice Solutions EMR. We assume that the billing service has a high collection rate on claims. Some background on our cost assumptions follow. Related: How Does Your Practice Measure Medical Billing Financials? IN-HOUSE: This was calculated by adding up the median salary of two medical billing employees ($80,000), healthcare costs for two employees ($9,000), federal and state taxes for two ($12,000), and training costs to keep the employees updated on the latest industry developments ($2,000). Finally, we’ve included $15,000 in ancillary costs for statement paper, office space, office hardware and other miscellaneous costs. OUTSOURCED: We factored in five hours of time per week required to manage tasks related to billing at approximately $15 per hour. Even the best medical billing service will require follow up from a practice about particular issues. That adds up to approximately $4,000 per year in administrative costs. IN-HOUSE: We’ve factored in an annual cost of approximately $7,000 for practice management software (~$200 per month, per doctor) and another $500 for computer hardware costs. This does not include the upfront cost of a software system. OUTSOURCED: This reflects the computer and printer the practice would still need to interact with the centricity medical billing service and print documents. IN-HOUSE: Clearing house fees for a provider submitting 20,000 claims per year would be approximately $300 per month ($100 per physician), or $3,600 annually. OUTSOURCED: A medical billing service usually charges a percentage of the amount collected as their fee. The industry average varies widely by specialty. We’ve used 7% for our primary care practice. IN-HOUSE: The percentage of revenue that a practice collects varies widely by specialty as well. Our hypothetical practice collects 60% of what it actually bills. According to industry experts, this describes an in-house billing department that is average at bill collection. OUTSOURCED: A practice can expect a 5% to 15% increase in the amount they’re able to collect by switching to a billing service. We factored in a 10% increase in the amount of money collected by a billing service as an average between the two. Many firms can help increase collection rates even more. Our cost comparison favors outsourcing billing, mainly based on the ability of a billing service to collect a higher percentage of the billed amount. Of course, this introduces a big “if.” That is, outsourcing makes more sense if the billing service improves collections significantly (i.e. on the order of 10%). But there are other factors – beyond costs – that a provider must consider in its decision making. Let’s examine the two approaches to compare advantages and disadvantages. The in-house procedure for processing insurance claims involves a number of steps that are universal to every practice. First, employees enter information into the medical billing software program from a “superbill,” which is gathered during a patient’s visit. 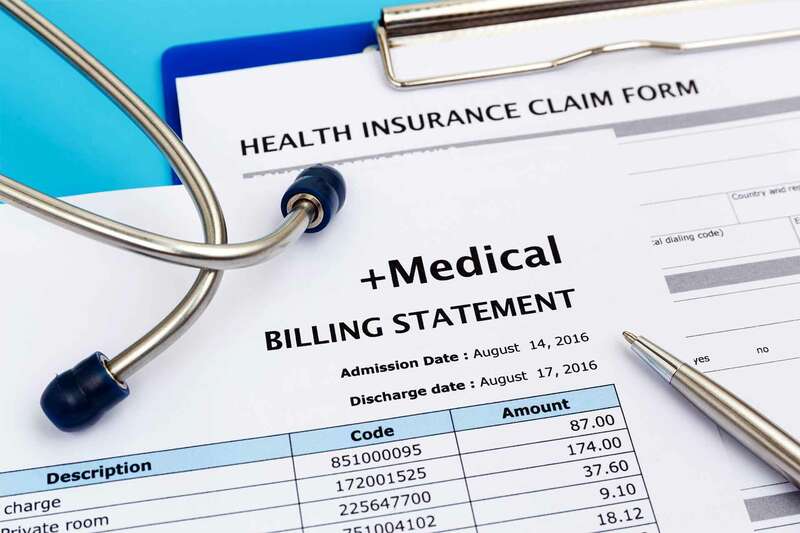 The superbill contains particular diagnosis and treatment codes, among other patient information, which the insurance company uses to determine if the claim is legitimate. Via the practice’s billing software, the provider then submits the claim to a medical billing clearing house, which verifies the claim and sends it to the payer. The clearing house scrubs the claim for the errors (for a fee) before passing it on to the payer. By not submitting claims directly to a payer, the provider saves time, money and lowers rejection rates. The clearing house also has the ability to format and submit claim data en masse in the various insurance company formats. Once the claim is rejected/accepted by the payer, notification of the claim’s status is sent to the clearinghouse, which updates the provider on the status of a claim. If a claim is rejected, the provider’s staff resubmits the claim once additional information has been gathered. The practice will be charge for each claim submission, even if it’s a correction. EMR software, especially those EMRs with an integrated practice management system such as Centricity Practice Solutions, has the potential to make in-house billing easier for a practice. EMR software, when integrated with a practice management system, will populate both system’s data fields. Diagnosis codes and other information needed for billing doesn’t need to be keyed into another system. This eliminates a second round of data entry. This tighter integration may be one factor that helps keep billing in-house. The process for outsourcing Centricity medical billing is more straightforward for practice staff. Superbills and other documents are scanned and electronically sent or mailed to the Centricity medical billing service. The medical billing service takes care of the data entry and claim submission on behalf of the provider. Most billing services charge a percentage of the collected claim amount. The industry average is approximately a 6% charge for processing claims through a medical billing service. The medical billing service takes care of much of the “dirty work” associated with the billing process. It will also follow up on rejected claims, pursues delinquent accounts, and even send invoices directly to patients. The convenience factor is a major reason that providers choose to outsource. If a practice is using Centricity Practice Solutions, then the process is even easier. Information from a patient’s superbill is stored in the EMR and electronically transmitted to the billing service. This eliminates the need to send paper records to the billing service. And because the EMR software eliminates an extra round of data entry, accuracy is also improved. One possible issue here is data integration between the EMR software and the billing service. The type of data being exchanged between the provider and the billing service will need to match, or else the data will need to be converted to a different format. Depending on the billing service, data conversion may be an option. Should You Outsource Your Centricity Medical Billing? Besides costs, there are other factors that would spur a provider to consider outsourcing their billing. Your billing process is inefficient. If you’ve been watching your collections drop while the time to collect increases, you may have issues in your billing department. Outsourcing to a third-party billing service typically decreases the number of rejected claims and decreases the time it takes to receive payment from a payer. You have high staff turnover. Turnover is an issue in any industry but turnover in a provider’s billing department is especially damaging. Claim processing is the economic life blood of a practice and a new addition or replacement in the billing department will inevitably lead to slowdown in the processing of claims. You’re not tech savvy. Keeping your billing in-house will require an investment in practice management software. Add in training for your staff and the significance of this investment becomes clearer. If you don’t want to deal with software upgrades and occasional technical issues, outsourcing is probably a good choice. You’re a new provider. New providers have plenty to learn and worry about aside from their billing. Outsourcing their billing right off the bat can give them much needed relief from the day-to-day stress of launching a new practice, without a trial by fire in hiring, training and managing employees. You have different priorities. Many doctors are not strong on the business side of running a practice. They became doctors to help patients – not worry about the administrative/clerical side of the business. Outsourcing the billing process eliminates the hassle and frees doctors to concentrate on patients. It’s important to note that a medical billing service isn’t a silver bullet for in-house billing issues. Billing services can vary widely in their efficiency and accuracy when processing claims. If a provider chooses a Centricity billing service that is lax and prone to errors, the headaches surrounding billing issues won’t get better – they’ll get worse. It’s important for a practice to factor in their individual costs and preferences when deciding whether or not to outsource their Centricity medical billing. In an apples-to-apples comparison, we found that outsourcing had the higher net income. However, cost isn’t the only issue practices should consider. There are plenty of other factors involved in this business decision that may be as – if not more – important than costs.